The Happy Dining Card is the gift that will have them happy as a clam! Dine on juicy surf & turf from Red Lobster or McCormick & Schmick’s. Enjoy the best in Italian from Bravo Cucina Italiana and Brio Tuscan Grille. Explore the flavor of Brazilian churrasco cooking at Texas de Brazil. And don’t forget dessert at The Cheesecake Factory! 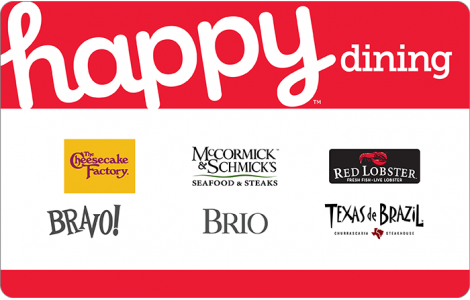 With flavors from all over the map, the Happy Dining gift card is sure to delight!